Each year a handful of BRIT volunteers and their Brittanys have a booth at this annual event. If you are interested in joining us contact Pattie at 888-552-7488. Vet School Open House started in 1993 as a small showcase of the college’s facilities with a petting zoo. This event has grown into a massive day of animal-related fun incorporating the entire veterinary complex coordinated by hundreds of vet students and undergrads for people from all over the state. 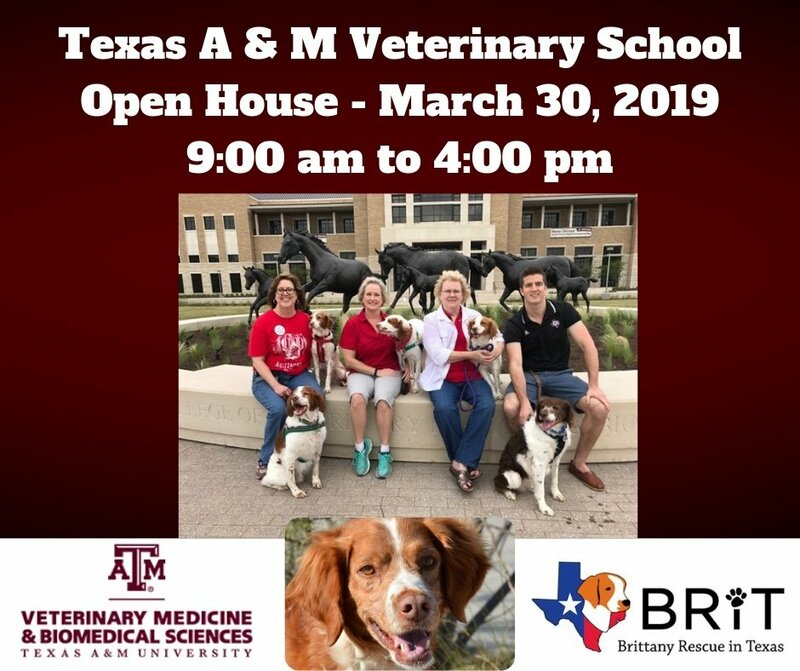 We open all the doors to the college and both hospitals and let the public see exclusively behind the scenes of Texas A&M’s premiere veterinary school. There are tours through both the small and large animal hospitals, many different exhibits for rescues and organizations, tons of demonstrations by all kinds of animal groups (agility dogs, trick horses, etc.) and animal exhibits galore! There’s a petting zoo, a reptile room with hundreds of scaly friends, even fistulated cows! We’ll also feature a Q&A panel with both vet students and the admissions committee so you know how to prepare for vet school if that’s in your future. You will get to see and learn about all the different aspects of veterinary medicine and best of all, it’s free! There’s no registration required either, all you have to do is show up and enjoy your visit. Thousands of people visit the college for this event every year, of all ages and backgrounds, and everyone really enjoys it! There’s definitely something for everyone. This year we have a lot of great things planned already! As the date gets closer there will pictures, schedules, and more details posted to our website so check back for more information. Or search for us on facebook to be a fan and get updates directly. Thank you for your support of Open House!